Positive crop yield effects from biochar are likely explained by chemical, physical and/or biological factors. However, studies describing plant allometric changes are scarcer, but may be crucial to understand the biochar effect. The main aim of the present study is to investigate the effect of biochar on root architecture under field conditions in a tropical setting. 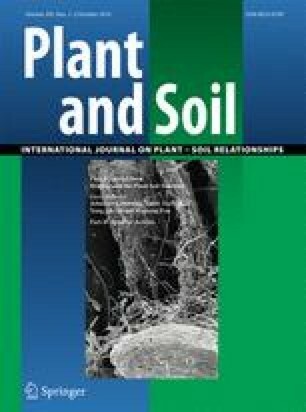 The presented work describes a shovelomics (i.e., description of root traits in the field) study on the effect of biochar on maize root architecture. Four field experiments we carried out at two different locations in Zambia, exhibiting non-fertile to relatively fertile soils. Roots of maize crop (Zea mays L.) were sampled from treatments with fertilizer (control) and with a combination of fertilizer and 4 t.ha−1 maize biochar application incorporated in the soil. For the four sites, the average grain yield increase upon biochar addition was 45 ± 14 % relative to the fertilized control (from 2.1–6.0 to 3.1–9.1 ton ha−1). The root biomass was approximately twice as large for biochar-amended plots. More extensive root systems (especially characterized by a larger root opening angle (+14 ± 11 %) and wider root systems (+20 ± 15 %)) were observed at all biochar-amended sites. Root systems exhibited significantly higher specific surface areas (+54 ± 14 %), branching and fine roots: +70 ± 56 %) in the presence of biochar. Biochar amendment resulted in more developed root systems and larger yields. The more extensive root systems may have contributed to the observed yield increases, e.g., by improving immobile nutrients uptake in soils that are unfertile or in areas with prolonged dry spells. Responsible Editor: Johannes Lehmann . Sampling and manuscript writing was done in the realm of FriPro project 217918 of the Research Council of Norway, the University Research Priority Programme “global change and biodiversity” of the University of Zurich and the National Research Programme 68 “soil as a resource” by the Swiss National Science Foundation. The Zambia Conservation Farming Unit (CFU) funded by the Norwegian Agency for Development Cooperation (Norad) is acknowledged for facilitating experimental setup as well as field assistance during sampling. Norbert Kirchgessner (ETH) is acknowledged for his support with the REST software. Sarah Hale (NGI) is thanked for comments on the manuscript.